Habitat: Desert. 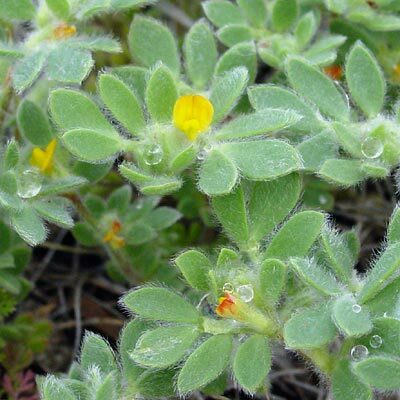 In years with sufficient winter rains, this tiny wildflower is common on rocky slopes and flats in the foothills. Description: The flowers are tiny and pea-like with orange on the back of the banner petals. The leaves are green, covered in soft, spreading, white hairs, and subpinnate or palmate with typically 4, oval, point-tipped leaflets. The plants are low-growing and mat-forming. 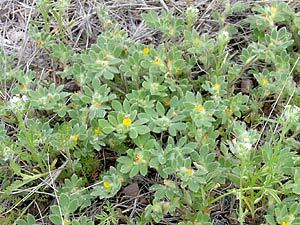 The similar Strigose Bird's-Foot Trefoil (Lotus strigosus var. tomentellus) is also mat-forming, but it has thickened, partly folded leaves.